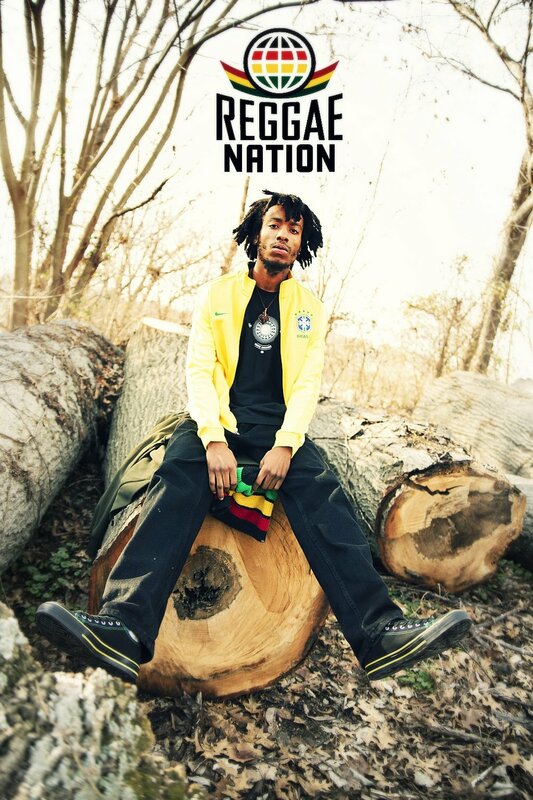 Natty Dread Rasun is an independent reggae fusion artist based in Louisville, KY, with a universal soul. Natty Dread recently released a ten song mixtape entitled "Natty Dread (Rise Up), produced by his in house producer Caliando On Da riddim, and we're very excited to share with you our exclusive interview with him about this new release, the important message he conveys with his music, his biggest artistic influences, and much more. What does the name "Natty Dread" mean to you and what message are you conveying with your music? The Name "Natty Dread" came about as i went through spiritual enlightenment. I was working a desk job at humana and had some time on my hands to listen to music via youtube when i came across a Bob Marley song titled "Natty Dread" I immediately related to it because i always wanted to grow my hair out in my natural state but due to the job maket and me being a Melenated person of color (Dreads, afros, and long hair) are often frowned upon. Hearing Bob Maleys "Natty Dread" song enlightened InI to the oppression among people of color in a babylonian system or civil system that we Live in here in Amerikkka. I started to change the way i dress and my appearance to fit my own personal preference, and my roots and culture. As i went through this change management at my job quickly started to profile InI and i was eventually fired. "Natty Dread" is simply 9ether or whole being. It is being the complete Man that I am without changing my appearance for social statue or liking of others. As i continued to grow and progress INI mind, body, and soul i ended up adding RASUN onto "Natty Dread". RASUN (RA-SUN) is a combination of RA which is the sun god of the kemites with SUN added onto it. It stands for INI as being the son of GOD and GOD at the same time. I consider myself a prophet, king, & spiritual being and im just continuing the journey i was on in my past life. Tell us about the creation of your new mixtape "Natty Dread" (Rise Up)". What are you most proud of with this project? Ahh (Laughs) THE creation of the Mixtape/Album "Natty Dread" (Rise Up) was nothing but the universe at its finest. I was riding down Market Street (my neighborhood) when i ran into an old friend of mine by the name of Cal or (Caliando On Da Riddim) who is my current producer and whom produced most of the tracks on the tape. He showed INI some beats that he had been working on and one in particular caught my eye. We immediately headed to my house and down to the basement and made "I FOCUS" which is the 4th track on the mixtape. Yea I said it, we recorded the track in my basement with no vocal booth; just a mic, dell laptop and STUDIO ONE PRESONUS. In fact all the recordings, instrumentals, mix and master were done by Iself & Caliando On Da Riddim. So everyone who thinks it takes a lot to make your music sound good, I am a living testimony that it can be dont right in the comforts of your own home. I blow myself away sometimes knowing that i record and engineer iself, i think that has been one of my biggest accomplishments thus far in this industry is learning to record and engineer iself and learning the business, and i repeat learning the business self sufficient is key to a successful career. To follow-up on the last question regarding the mixtape, we really dig the cover graphic. How did that come about and who designed it? I actually designed the cover myself. A lot of time when it comes to my creative process i run off of impulse, and what I'm feeling at that moment. I was in the studio vibing out to some of the tracks on the tape; while google searching for pictures to edit for my cover and i stumbled upon the lion head and immeadiately got to work. Pixlr Express is one of the most easy online editing programs I use to edit pictures, and has by far saved me on cover art. Once again reverts back to being self sufficient and using what you have at hand to create and be creative. Don't tell everyone about pixlr express (Laughs) Just joking, I love to share my techniques to others, I believe in the sharing of knowledge and ideas, its the only way to grow! Who are some of your favorite reggae artists? And how have they influenced your music? Some of my favorite Reggae Artiste of the New Generation of Reggae or Reggae Revival include Kabaka Pyramid, Chronixx, Kelissa, Keida, Yaadcore, Dre Island, Runkis, Xana Romeo, and Protoje. They have influenced INI in more ways than just musica, but have introduced a lifestyle of roots, culture, and healthy eating through the teachings of RastaFari. Reggae musica in general has opened my eyes to how big and beautiful the world really is and that i should take pride and ownership in what my ancestors have done before I, Lets just say the "HIDDEN COLORS" of time have been revealed to INI, my 3rd eye is open and I am awake! Tell us about the music scene in Louisville? Is the city supportive of its native artists, such as yourself? The musica scene in Louisville is very slow. Louisville, Ky caters to alternative bands, bluegrass music, and rock more than anything; although there are many people who make soul filled music such as jazz, hip-hop, Reggae and R&B. Our city is disbanned and torn apart due to the common wealth system that oppresses us, its very hard to make it out of Louisville, KY without some kind of connection to cities that are fond of the arts such as NY, California, etc. That's why i am always trying to branch out and network with people in the big cities and surrounding areas instead of Louisville. Louisville is a great city and made me who I am today but i don't picture myself staying here much longer, the opportunity for artists of my caliber and genre just doesn't exist here without major connections. I love my city no doubt, but the city is not fond of the arts in my opinion just derby horses, booz, and money! What message do you have for our readers? Why should they check out "Natty Dread (Rise Up)"? Everyone should check out "Natty Dread" (Rise Up) The Mixtape/Album simply because its what the industry has been missing. I attack every aspect of music from hip-hop, R&B, Reggae, Soul, conscious lyrics, and all original beats. Their is no one out that i think you can compare INI too. I create so much musica on a daily basis i feel as if i have fused everything into one original sound that will not be duplicated for a long time coming. When you spend countless hours just making musica non stop without a care in the world you begin to become a natural. Their is no waiting around for a lyric or message, tings just seem to flow naturally. "Give Thanks, fi all de reader dem and DOPECAUSEWESAID.COM, Humble beginnings, BLESS UP ASE"